Integrated Fire Protection Private Limited (IFP INDIA, in short) is a private limited company with its head office at Kolkata, India and its manufacturing unit at Jalpaiguri, West Bengal, India. IFP INDIA is the pioneer and leading manufacturer of fire fighting foam concentrates in India, incorporated in the year 1984, with its technical collaboration from Fire Fighting Systems (FFS) AB Sweden, a leading firm in Western Europe in this field. Our commitment is to manufacture and supply of special hazard fire protection products includes fire fighting foam, extinguisher, hand line applicator and dry chemical powder of national / international standard to the customers in India and abroad with strong focus on Customer Satisfaction in product quality and services. In-house R & D Unit of IFP INDIA, recognized by DSIR, Govt. of India, is providing enormous effort for achieving customer satisfaction by continuously improving product quality and development of new products in the field. We have In-house R & D unit, recognized by Council of Scientific and Industrial Research, Govt. of India, involved in research and development activities since the inception of the company, in respect of Quality improvement, Import substitution, New product development, New process for manufacturing etc. The unit is continuously updating different environmental concerns related to the foam concentrates, dry chemical powders and gaseous fire extinguishing systems. The well equipped laboratory is having instruments required for evaluation as well as development activities from the root itself. The Mini-library contains most of the journals in the field of Fire and safety to have the knowledge as well as the development purposes. IFP Laboratory of Integrated Fire Protection Pvt. Ltd. is one of the testing laboratory in the field of testing of fire fighting foam concentrates. The laboratory is having the testing facilities of foam concentrates, dry chemical powders, extinguishers etc. as per Indian and international Standards of repute. 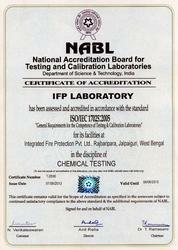 IFP Laboratory is a NABL accredited laboratory for testing of foam concentrates as per Indian Standard and UL 162. The laboratory meets the requirement of the standard ISO/IEC 17025:2005 for its Laboratory Management System. IFP India is one of the leading manufacturing unit for Fire Fighting Foam Concentrates, Dry Chemical Powders, Fire Fighting Equipments and Fire Extinguishers. IFP India is ISO 9001:2008 and ISO 14001:2004 certified company. The most of the fire fighting foam concentrates are manufactured from the fluorosurfactants which was the most concerned factors due to having PFOS in it, as this material is of PBT (Persistent, Bioaccumulative and Toxic) in nature. The fluorosurfactants we are using are not containing the PFOS and therefore safe for environment. Due to our continuous R & D efforts it becomes possible to offer the foam products environmentally friendly in respect of its biodegradability, toxicity etc. The most important gaseous extinguishants till date are HALONS which are being out of phase for production and use due to their Ozone Depleting Potential, which destroys the stratospheric ozone layer and accordingly allowing the UV radiation to the earths surface. To substitute the HALONS the most nearby alternate agent is FE-36 of DuPont used in IFP Brand Extinguishers.